The continuing adventures of Super Grover as he interacts with Rick, Laura, Saul, Max and their friends. one distinguished for action and admired for courage. It’s a great thought, and positive ideal to live by. It’s also a realistic possibility for anyone and everyone. Our tradition teaches us to act. Sometimes it’s a little action, random act of kindness, very doable act to make the world a better place. 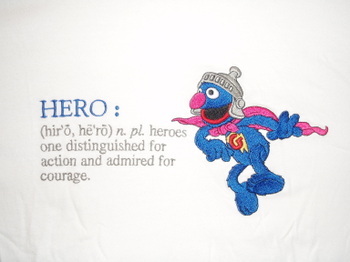 If a mild-mannered, somewhat klutzy, lovable, furry muppet who spends his days working as a waiter and communing with the other regulars on Sesame Street can be a hero, then so can you.